XIPHOS. What is it, where is it, and if you find it, what do you do with it? The answer to all these questions and more will be revealed thanks to the coldest killer in the Universe, the Han Solo of Adlington, yes you've guessed it - me. The game is based on the continuing struggle between two warring factions in deep space (the Plo and the Qon), both of which are descendants from the same race, which in the distant past was silly enough to delegate total responsibility of running their near perfect world, to their ultimate creation Xiphos (booo, hissss). Xiphos is a somehow familiarly mad entity, and would be villain of the piece. A huge super intelligence, which for reasons best known to itself, after hundreds of years of trouble free service, one morning announced "I quit". Thereby plunging the now totally dependent Xiphonions into a technological dark age, with no power and no expertise to rebuild their crumbling culture. You play the part of an undercover agent sent by the Galactic council of which the Xiphonion system was formerly a member. Your mission is to traverse the six levels of Xiphonion inner space, at the centre of which is Xiphos, not only responsible for the demise of the Xiphons but also suspected of causing strange disappearances and possibly altering the fabric of space time. In order to travel through the increasingly hostile levels you take on the guise of a wandering mercenary fighting for either side, allied only to maximum profit. This has a dual purpose, not only disguise, but as the only method of raising sufficient funds via bounty, to buy supplies to continue your quest south, and towards Xiphos via the pole base at the southern end of each level. Here lies the trading aspect of the game. After firstly picking your target carefully and dispatching them to the next level of consciousness you will receive your reward, with which you can trade for goods with your victim's opponents. A map can be built up of the various locations of stations and their allegiances, although this can change due to conquest. The conservation of resources is essential, as running out of energy was the main reason for my regular and early demise. It's perhaps slightly unfair to compare Xiphos with Starglider II constantly, but it's almost unavoidable with the graphic similarity and the general scenario. Nevertheless I still feel the program lacks depth, being essentially a multi-level shoot-em-up, with a bit of simple trading for good measure. When I first loaded the game and flicked through the manual, my first thought was, "Great!... At last, Starglider III or there abouts". Unfortunately that's not the case. The graphics are very similar, the backgrounds being very impressive and, with the possible exception of the tractor beam which looks like it was stolen from a Speccy, they're great. The fairly usual run-of-them-mill pings and explosions. A few years ago they would have been grat but they all seem a little too familiar now. The dog fights are perhaps a little too tricky, making the accumulation of the required credits and as a result, the purchase of essentials, simply a little too hard. The words "I quit!" blipped on the screen in every Xiphon home one morning. The message came from their central controlling computer, Xiphos, which governed everything from their five-level self-contained universe thorugh to their pizza delivery service. In the resulting chaos what the Xiphons did was what any self-respecting civilisation would have done in the circumstances: start a civil war. Disguised as a mercenary, you must fly a ship into the heart of the Xiphon galaxy, find the central computer and trash it. Information is sketchy, but what is known is that there are two main Xiphon factions, the Pios and the Qons. From their starbase installations in orbit around the planet they fight in small-scale skirmishes. It's OK to bag victims from either side of the warring Xiphon factions and store the kill value to trade in at the opposition's space stations, spending Pio kills at Qon bases and vice versa. Never, ever, under any circumstances, forget whose stations you're on, because both races get touchy if they are offered their own dead. Xiphos isn't just about zapping around the universe blasting anything in sight. Initially your ship's weapons are limited, as is the fuel supply, so economy of travel and careful preying on wounded battlers is advisable. You must also maximise the ship's resources, building up the credits that will allow you to get to the next star gate and one step closer to the planet Xiphos. Trade is at the heart of the game: only by bartering for the best prices will the mission be feasible. When you want to trade, hail the nearest station and they will hook you up on the tractor beam to drag the ship in. Then it's haggle time. You can't just pay the asking price, or you will end up getting burnt. Besides which, no-one will respect you. Xiphons only ever respect strength. This is a seriously smooth trip into the land of all that's wird. The 3D universe lets you ring off in all directions at eye-befuddling speed. The graphics make combat realistically tough. No long laser duels her: ships flash past, making anticipation firing essential until you can afford homing missiles. The ships are well drawn in the vector style, as are the bases, and the further you get into the game, the more varied the designs become. The control panel is laid out in classic Elite fashion, with the all-important radar clearly visible in the centre. Other controls are not so easily deciphered and make it tough on the monitoring front. There are five different universes to explore, which means there's plenty of flying and fighting before you finally have a chance to waste the computer. With the arts of war and commerce to master there's learning potential by the score. Yet getting rich enough to buy the more exotic goodies is had going - many pilots will be lost before you leave the first galaxy. Earning cash is directly dependent on killing, and since killing is difficult, initial appeal is limited. Plus the ship starts out seriously weak so you must bag a couple of Xiphons just for a fuel top-up. In the beginning there was Elite. The software houses looked at it and realised it was a winner. With the genre now established many have tried to produce an Elite beater. Xiphos has better graphics, a stranger universe and great subtlety. Yet somehow this doesn't help it beat its archetypical forerunner. The trading options are initially too limited with pilots caught in a never-ending cycle of killing and refuelling, unable to gather enough credits to make exploration possible. Really it is a space-trading sim that is only for the seriously committed. Others will find it monstrously testing on the stamina front, even when they are just trying to maintain enough energy to keep the ship running. UP is space as we know it. U1-5 are the five layers of the Xiphon system. 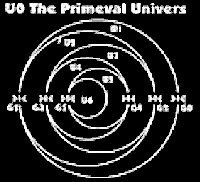 GO (Gate 0) gives you access to U1 (Universe 1) and explorers must make their way to G1 in order to pass into the second-layer U2 system. Each gate exerts a 'gravitational' field effect. This means more energy is expended flying towards an exit gate than an entrance. For ease of comprehension among human pilots the two are viewed by the shi's on-board computer as North/South poles. Note, too, that the gateways are controlled and a transit tax is levied on all who pass through; so make sure you've plenty of credits spare. Die Xiphons haben sich ihr eigenes Universum geschaffen, das aus fünf eigenständigen Systemen besteht. Diese sind wie konzentrische Ringe angeordnet, mit Xiphos in der Mitte - einem intelligenten Wesen von gigantischen Ausmaßen! Der Spieler steuert ein Raumschiff, das mit Raketen, Radar und Navigations-computer ausgerüstet ist. Ein Sichtfenster zeigt das Universum, in dem man sich befindet, mit den Raumstationen und -schiffen in 3D-Vektorgrafik. Die Aufgabe besteht darin, sich durch die fünf Systeme "durchzuarbeiten" und letztlich den bösen Xiphos zu zerstören. Man treibt Handel, um Sprit, bessere Raketen oder die Eintrittskarte für das nächste System zu ergattern; die nötigen Tausch-Credits erhält man durch das Abschießen von Raumschiffen, die den (untereinander zerstrittenen) Völkern der Xiphons gehören. Bis jetzt hört sich das alles sehr nach Elite an, aber es gibt auch Unterschiede: Man muß sich hier seine Gegner schon etwas genauer anschauen, bevor man sie abschießt - vielleicht braucht man die Kerle noch! Außerdem gibt es eine Art Schwerkrafteffekt: Der Flug nach "Norden" verbraucht Energie, während der Flug Richtung "Süden" zusätzliche Energie bringt. Xiphos kann man passionierten Raumfahrern ohne Bedenken ans Herz legen. Spezialität: Im "Raid-Modus" kann man unter vereinfachten Spielbedingungen (keine "Schwerkraft" und kein Handel) ganz unbeschwert das Ballern üben.